wiradikusuma: Indonesia is following me now? Indonesia is following me now? I was very surprised when I checked my inbox this morning. 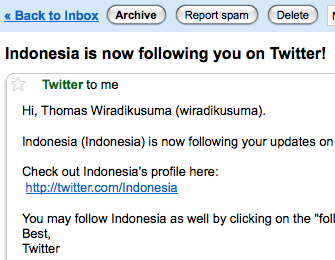 The subject said "Indonesia is now following you on Twitter!" Oh my, what did I do? Apparently it's somebody having account "Indonesia" (simply a username) following me. Phew, how relaxing! Anyway, it's kind of surprise that, although not significant, almost every week that some new people are interested in what I'm doing. It's interesting because I'm not advertising it in any way (it's http://twitter.com/wiradikusuma, in case you're wondering). I'am following you too, your posts are very refreshing :D. I wonder, how do you manage your time? It seems that you have a lot of time to try new things. hi bustanil, thanks for following, the key is "passion" :) and, oh, traveling office-home is expensive (in terms of time and energy). you can do more if you can reduce your travel time.